The Three Peaks, the tough testing course for the Dales walker were conquered yesterday by a 14-year-old Yorkshire schoolboy – on a bicycle. He is Kevin Watson, of Ridgeway, Raikes Road, Skipton, a pupil of Ermysted’s Grammar school, Skipton. He rode, pushed and carried his bicycle 30 miles to the summit cairns of Whernside (2,419ft. ), Ingleborough (2,373ft. ), and Penyghent (2,273ft.). And he complied with the accepted condition of the walk by finishing at his starting point. So just before his 14th birthday, Kevin walked the circuit, taking note of possible tracks for a bicycle. He planned to make the attempt later this year. 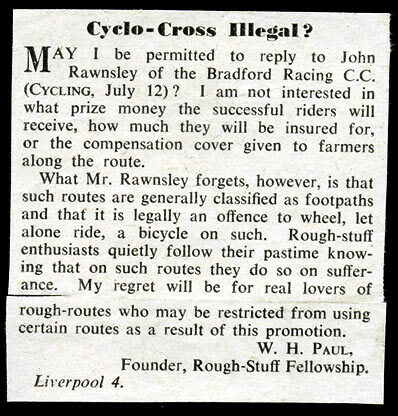 Then he heard that a party of Leeds cyclists was planning to cover the circuit. So he decided to go ahead at once. PEAK POWER PEDALLING! Rough-stuff riding with a difference. The Three Peaks of the Craven Dales – Whernside, Ingleborough and Penyghent – have long been a tough testing course for the fell walker. Now Yorkshire racing men are engaged with the possibility of incorporating them into an annual race. Crossing the Craven Dales has for long been a favourite adventure of the rough-stuff enthusiast. 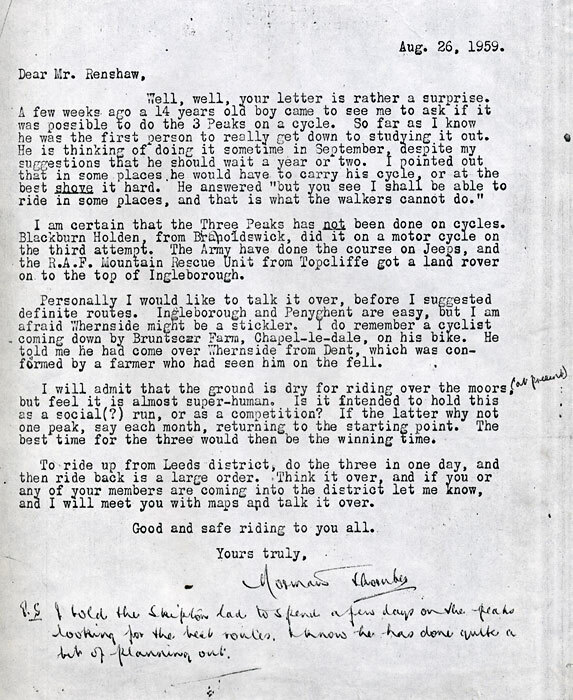 The dry summer in 1959 has meant that bicycles could be ridden over bleak moorland that normally is soggy. In an attempt to make a round circuit of the peaks in four hours, ten members of Bradford Racing Cycling Club made a mass assault on October 4. But after a gruelling struggle only six finished the course. Three of them, experienced rough riders at speed, set up a new “record” of 4 hr. 33 min. They were the men who won last winter’s British national cyclo-cross team championship: Colin Spaven (22), Harry Bond (20) and Jeff Whittam (25). Whittam had to change a tube when he punctured near Hunt Pot, just before tackling the Penyghent slope. Spaven broke a handle­bar bolt after crossing two of the peaks. Ralph Parkin (30), of Shipley, who clocked 4hr. 38 min., said most of the riders were handicapped through lack of knowledge of the area. Bryan Church (23), completed the course in 4hr. 40 min. 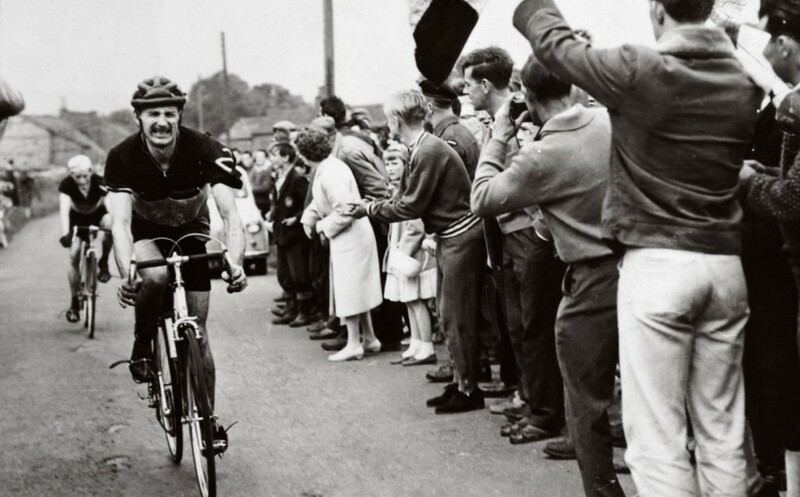 He was followed 12 minutes later by clubmate Pete Tesseyman (29). 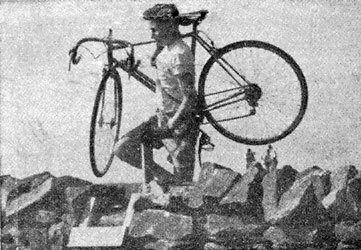 Appetites for peak-pedalling were whetted in early September when Kevin Watson, a 14-year-old pupil of Ermysted’s Grammar School, Skipton, became perhaps the first person to make a closed circuit of the peaks by bicycle. Starting and finishing at Horton-in-Ribblesdale, he took his lightweight 30 miles to the summit cairns of Whernside (2,419ft. ), Ingleborough (2,373ft.) and Penyghent (2,273ft.). His overall time was 6 hr. 45 min. He rested for a total of 1 hr. 17 min. It was a case of push and carry up the gritstone scree that cover long stretches of the steep slopes. But Watson, winner of this year’s junior cross-country at his school, found many opportunities to ride. A week later three members of Leeds C.T.C. Intermediate Section set out on a circuit. One of them retired with foot trouble, but brothers Malcolm and Neil Renshaw cut halts to a minimum and beat Watson’s time by about 15 minutes. Towards the end of September Malcolm, a 21-year-old bank clerk, made a solo circuit and cut his own time to 4¾ hours. 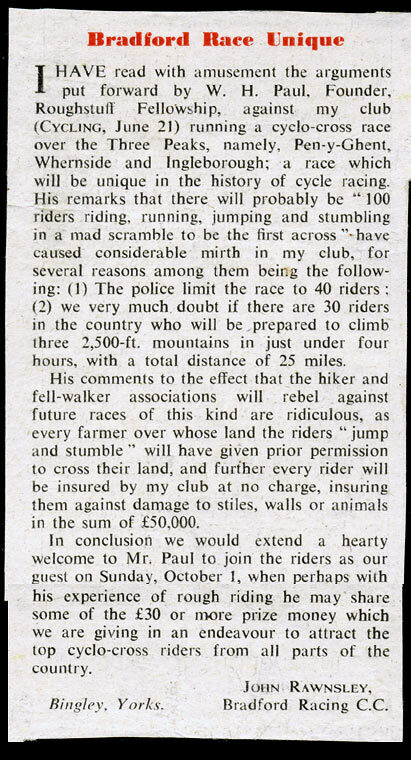 Watson got the idea of riding the peaks when he watched runners in the annual Three Peaks fell race. He spent his summer holiday walking over the area and mapping out pos­sible tracks for his bicycle. 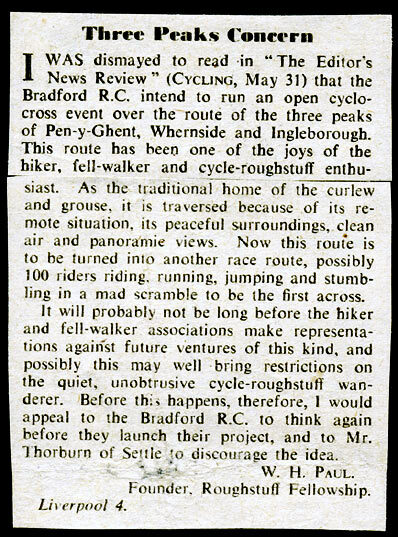 Norman Thornber, author of the book “The Three Peaks,” and a chronicler of Three Peak performances, believes that much interest would be aroused in an annual cycle race. He gives a trophy to the winner of the annual foot race. George Brass (Clayton-le-Moors Harriers) holds the record (3hr. 8min. 25sec. ), and cyclists are now wondering how close they can get to this time.